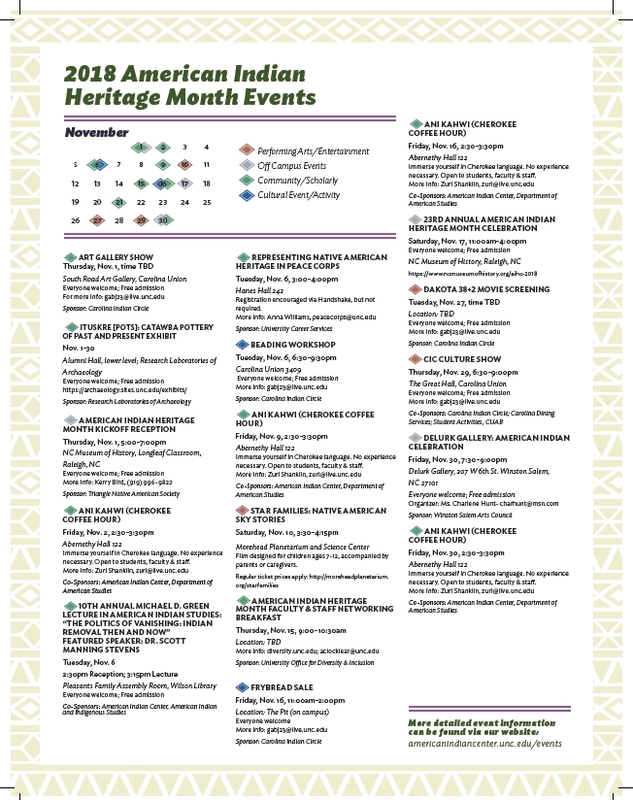 November American Indian Heritage Month Events and Programs! 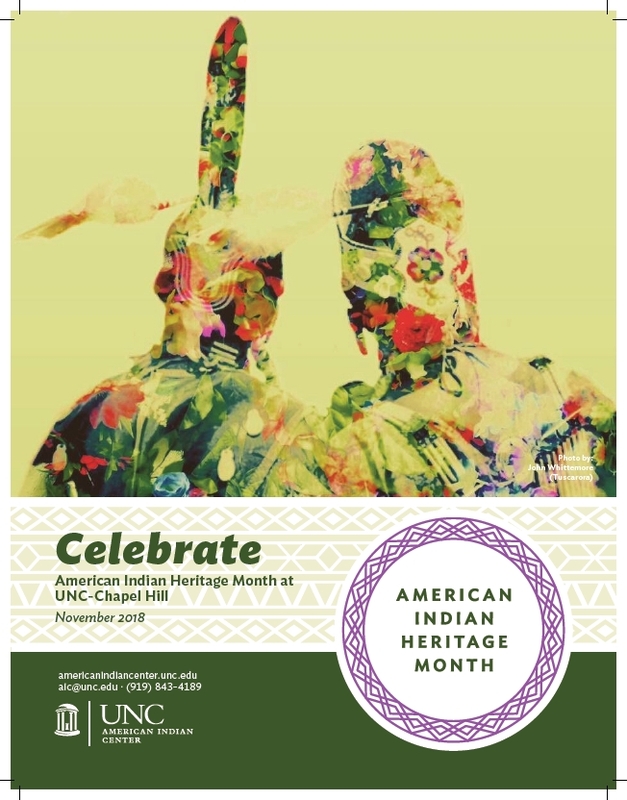 The UNC American Indian Center is pleased to share with you a calendar of events for November in celebration of American Indian Heritage Month! The month-long celebration will include lectures, cultural activities and discussions, film viewings and more, both on and off campus! On Tuesday, November 6, Dr. Scott Manning Stevens will serve as our guest lecturer for the 10th Annual Michael D. Green Lecture in American Indian Studies. Dr. Stevens’ lecture is entitled, “The Politics of Vanishing: Indian Removal Then and Now.” A reception will begin at 2:30pm, followed by the lecture at 3:15pm. The event will be held in the Pleasants Family Assembly Room of Wilson Library. The lecture is sponsored by the American Indian Center and American Indian and Indigenous Studies. For visitor parking information, click here. A campus map can be accessed here. See the calendar below for a complete listing of events! All events are free and open to the public unless otherwise noted. Chancellor Folt Signs Historic Resolution with NC Native Nations! On Oct. 23, 2014 the American Indian Center hosted the First Annual Forum on the Role of Higher Education in Native Nation Building, in partnership with The Friday Center. 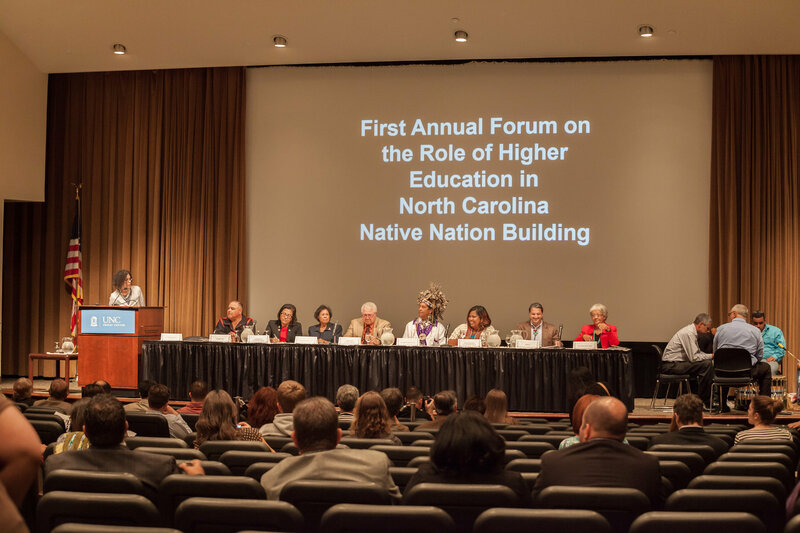 The forum served to kickoff American Indian Heritage Month in November at UNC-Chapel Hill. This gathering was historic in that Chancellor Folt signed a resolution with all eight NC Tribal Nations, resolving to continue and strengthen the University’s commitment to research, education and service with those Native Nations. The resolution also emphasized the University’s commitment to holding similar gatherings to reinforce and strengthen relationships with the NC Native Nations—the Coharie Tribe, Eastern Band of Cherokee Indians, Haliwa-Saponi Indian Tribe, Lumbee Tribe of North Carolina, Meherrin Indian Nation, Occaneechi Band of the Saponi Nation, Sappony, and Waccamaw Siouan Tribe. The resolution can be accessed here. North Carolina is home to the largest American Indian population east of the Mississippi River, including eight Tribal Nations and four urban Indian organizations. American Indian Heritage Month was first proclaimed by President George H. W. Bush in 1990. It recognizes contemporary American Indian tribes and individuals as active participants in American society and honors their histories, cultures and achievements. November marks a time to note the existence of Indian tribes and reflect on their significance in American history and contributions to American culture. Indians are not just beads and feathers; they are real people doing important things in contemporary American life. A ceremonial presentation of Gov. Pat McCrory’s proclamation of November as American Indian Heritage Month to the UNC system was held today (Nov. 25) on the steps of Abernethy Hall, which houses the American Indian Center on Carolina’s campus. The American Indian Center is only center of its kind within the 17-campus system. U.S. Census data from 2010 indicates that North Carolina is home to more than 122,000 American Indians, the largest American Indian population east of the Mississippi with 14,000 years of American Indian culture and tradition. In the proclamation, Gov. McCrory calls upon citizens, institutions and government agencies to commemorate American Indian Heritage Month with programs, celebrations and activities of the American Indian population, honoring their heritage and contributions as North Carolina’s first people. The event included a short performance of Native American music. Jarrod Lowery, the governor’s community outreach liaison and a Lumbee Indian, read and presented the proclamation. The presentation was followed by brief remarks from Executive Vice Chancellor and Provost James W. Dean Jr. Photos by Dan Sears of News Services. The American Indian Center celebrates American Indian Heritage Month (AIHM) with a calendar filled with programs, tours, workshops, and performing arts events focused on American Indian traditions, culture and current issues. The 2014 AIHM Calendar will be posted soon!